Nastawgan is a word still in common usage amongst the older, native-speaking Indians of Northeastern Ontario. Nastawgan are the ways or the routes for travel through the land of the Temagami district in Northeastern Ontario, just south of the height-of-land. Before the advent of roads and railways, waterways provided the principal routes for travel and communication over much of the shield country of Northeastern Ontario, including the Temagami and Lady Evelyn watersheds. It was much easier to travel on the waterways than to traverse the rugged, rocky and densely forested terrain. Waterways were used not only in the summer for canoe travel but also in the winter for travel by snowshoe and toboggan. In many instances, the winter routes of travel varied little from those used in the summer. A trail network based on waterways provided a wealth of natural campsite locations as well as access to fisheries which furnished a major portion of the summer diet for early residents. Unlike land-based trails, full exposure to biting insects was limited to campsites and portages. Onigum or canoe portage trails were maintained to by-pass unnavigable portions of the route: rapids, falls, heights-of-land between waterways and floatwood jams known to fur-trade canoemen as "embarrasses." Although onigum (portages) and bon-ka-nah (winter trails) were part of the nastawgan, there were advantages to using waterways for both winter and summer travel in preference to the land trails. Probably the most important advantage was the ease of transport for equipment and supplies. Before the arrival of Europeans, the native population did not have horses or cattle to serve as beasts of burden. Without the use of the wheel, summer land transport was limited to dog travois, dog packs and to what a person could drag or carry. On lengthy land routes this imposed severe weight restrictions. An onigum or canoe portage identified by the author between Bob and Obabika Lakes. Note how the cedars are malformed, curving out from the trail, from years of passing portagers. Canoes, on the other hand, permitted extraordinary loads of equipment and supplies to be transported even on the most difficult routes. For every mile of travel only a fraction was covered by portage. Because of the relatively small portion of the total distance requiring portaging, several trips could be made over each portage without significantly slowing progress. As long as the cargo could be subdivided into units which could be carried, large loads were transported with relative ease. Another advantage was the limited maintenance required to keep the routes passable. On the water portions, maintenance was restricted to cutting out fallen trees which obstructed travel on narrow creeks. 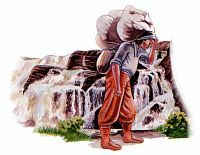 The portages or onigum themselves received maintenance similar to that of any land trail, but being short they were relatively easy. Most work consisted of breaking down obstructing branches and sometimes marking the route by blazing trees with an axe. Fallen trees blocking portages were rarely removed, especially if cutting was involved. Either a few branches were knocked off so one should step over the tree, or the trail was simply re-routed around the obstacles. Onigum passing over wet areas received greater attention. Logs were laid on the ground to improve footing. In some instances, metigo-mikana was used to replace simple logs for traversing wet areas. Unlike the corduroy of the pioneers, metigo-mikana was laid longitudinally in the direction of travel so that a minimum of cutting was required for construction. The walkway was often three poles wide, connected by cross stringers which provided lateral stability. Cedar was the preferred building material. Joints were often notched and secured by spruce root. In the winter, use of frozen waterways meant limited trail maintenance and relative ease of transport. Travel on frozen lakes proved much easier than on trails over rugged terrain. Not only did the lakes provide a level surface for pulling toboggans and sleighs, but the wind-packed snow frequently encountered on lakes was more easily traveled than the deep, soft, mid-winter snows common to sheltered land trails. A man in good physical condition could pull over frozen lakes a load of 90 pounds on a toboggan all day without tiring. On the uneven terrain of many land-based trails, this would prove an exhausting if not impossible task. Onigum constituted such a small portion of the total distance that the deep unpacked snow of these portage trails could be profitably broken by snowshoe in advance of bringing across the load without too much loss of time. If the load still proved unmanageable, it was broken up and dragged across in portions. Depending on weather conditions, as much as three months of the year was poor for travel along water routes. Freeze-up and break-up have always been a most difficult time for wilderness travel in the Canadian North. For a period during freeze-up, the open season for canoe navigation could be extended by making arduous land detours around shallow lakes which had already frozen. Otherwise, the traveler could use a canoe-sleigh to transport the canoe across the ice. If the ice was not too thick, it could be broken with a paddle or axe to reach open water. Barres d'abordage or canoe shoes could also be added to the outside of the canoe's hull to protect it from ice damage, but soon even this became impossible. Travel on the water routes was usually suspended until the ice thickened sufficiently to support at least the weight of a man. Even now most experienced wilderness travelers consider spring breakup to be the most unsafe time to travel, because of the unpredictable strength of the ice. Sometimes, however, the period between travel on ice and travel on open water can be as little as two days. Traditionally, travel on weakening ice-plates was accomplished by the ingenious employment of the canoe-sleigh. A canoe was secured in an upright position on top of the sleigh and the travelers walked along the surface of the ice holding on to the ends of the canoe. Often two or three dogs were harnessed to assist with the pulling of the load. If the ice gave way, the travelers quickly jumped into the ends of the canoe, preferably before getting wet and thus very cold. The sleigh would then be untied from the bottom of the canoe and placed inside. The cycle would be completed by running the canoe up on solid ice and reloading. As this type of travel was slow and dangerous, it was usually undertaken only in times of extreme necessity. surrounding inflows can be dangerously thin, not unlike ice in other areas with current, such as narrows or obstructing shoals. Underwater springs whose water is several degrees above freezing create an additional hazard. As a result, well-defined routes of travel were sometimes established on the most dangerous lakes. If the route was to be followed frequently, the designated snowshoe path was often marked at regular intervals with evergreen boughs. This was done in anticipation of the packed trail becoming obscured by drifting or new fallen snow. Even if covered with new snow, a packed trail provided a firmer base for sledding and snowshoeing. Since the packed trail was elevated above the surface of the ice there was less chance of encountering slush that would freeze onto the snowshoes and the running surfaces of the sleighs. For the bon-ka-nah or land trail portions, extensive use encouraged an increase in the amount of trail maintenance undertaken. This included trail marking by blazing trees, and greater efforts to remove windfalls and overhanging limbs. Since side-sloping trails were very difficult to negotiate with toboggans and sleighs, the surface of the trail was often leveled with a snow shovel at the worst locations. Leveling was especially needed where the trail traversed the sides of hills. Shovels were also used to fill in the hollows along the trail if heavy freighting was to be undertaken. Seepage of ground water was another problem. Since water coming from below the ground is several degrees above 0ºC, it resists freezing even in very cold air temperatures. Rivulets of ground water cannot easily be detected when they flow under the surface of the snow. However, when a winter trail was packed down, the flow of water often melted away the entire layer of snow within a few hours. To repair the trail at these locations, it was common to cut evergreen boughs and place them over a series of sticks laid in the washout, thus creating an insulating mattress of vegetation. Snow was then shoveled over the boughs and packed down with snowshoes to freeze and create a snow bridge. The warm water could then pass under the trail through the sticks and boughs without melting away the surface of the trail or the snow bridge. Occasionally, it was necessary to construct simple bridges or ramps. The bridges were used for spanning open creeks or sharp gullies while the ramps were made to facilitate scaling of abrupt rock ledges along the trail that could not be bypassed. Most ramps would take the form of a ladder with two outer, spanning poles connected by a series of cross rungs. The larger structures were rarely "brushed" with boughs. Instead the sleighs and toboggans were hauled up over the bare wood rungs. This permitted snow to pass through the structure, thus preventing a buildup which would allow the sleighs and toboggans to slip off the side of the span. These trail improvements were always undertaken only to the extent warranted by normal use. Travelers put in the minimum of work needed to keep the routes passable throughout the winter. Some exceptions to this generalization did develop in the Temagami district. After contact with Europeans some routes were significantly upgraded for winter freighting by employees of the Hudson's Bay Company. 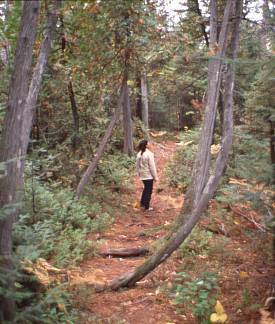 Up until the 1940s, over 75 well-maintained bon-ka-nah existed in the Lake Temagami area. Macominising (Bear Island), Wa-wee-ay-gaming (Round Lake), Shkim-ska-jeeshing (Florence Lake), Abondiackong (Roasting Stick) [campsite on Sturgeon River near Josephine Creek], Non-wakaming (Diamond Lake) were major intersections in this system of winter trails. Depending on the nature of the local topography and waterways, the bon-ka-nah ranged from a few hundred meters to many kilometers in length. Often the shorter bon-ka-nah formed links between a chain of ponds used only for winter travel. For example, the winter route from Maymeen-koba (Willow-Island Lake) to Ka-bah-zip-kitay-begaw (Katherine Lake) followed a series of small ponds and connecting bon-ka-nah lying between the two branches of the Manja-may-gos Zeebi (Lady Evelyn River). It took detailed knowledge of the terrain to determine the best location for many of the longer bon-ka-nah. Much evidence survives of the skillful use of swamps and geological faults in order to keep the trails direct and to minimize climbing. An outstanding example of using geological faults for easy passage through hilly terrain can be found today in a long fault which runs from Scarecrow Lake adjacent to lshpatina Ridge, the highest elevation in Ontario, cross country through Florence, Diamond, Jackpine, Net Lakes and the Ottertail River to Lake Temiskaming. No less than 14 bon-ka-nah are located along this great fault. The onigum and bon-ka-nah of the Temagami district total over 1,300 in number. But inter-related network of summer and winter trails represents only a small portion of a larger system of nastawgan that until a few generations ago covered most of the Precambrian Shield country of eastern Canada. They defined the way of the wilderness traveler. Fortunately, the nastawgan of the Temagami district have remained in a largely unaltered condition. These ancient wilderness routes represent an important remnant of Canada's cultural heritage. *Author's note: The material for this article has been derived as part of a detailed on-going study covering Northwestern Quebec and Northeastern Ontario. Sources include archival map collections, survey records, and especially personal field inspections. Particularly useful were interviews with many of the elders of the Teme-augama Anishinabay on Bear Island and elders of adjacent Indian bands, some of whom are now deceased. This invaluable resource has provided deep insight largely unobtainable from the written record. Excerpted from Nastawgan: The Canadian North by Canoe & Snowshoe (Edited by Bruce W. Hodgins and Margaret Hobbs) and published by Betelgeuse Books. Reprinted with the permission of Craig Macdonald and the publisher.